Arrange your round-trip airport transfer in advance and skip the hassle of booking a service in Honolulu. This convenient form of transportation takes you from Honolulu International Airport (HNL) to your hotel or cruise terminal, and then back again. Spend more time enjoying your trip and less time puzzling out the logistics. Enter your details when you book, and your transfer is confirmed automatically. 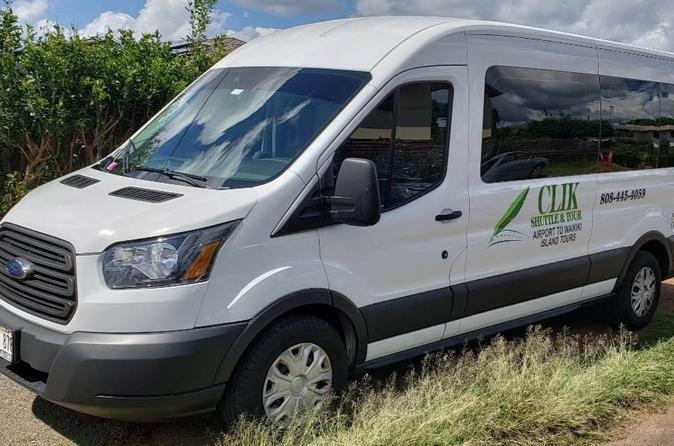 When you land, bypass the taxi lines, show your confirmation voucher to the driver and then step inside our 11-person Ford Transit shared shuttle. This service covers transportation from the Honolulu International Airport to your hotel in Waikiki. For your return trip, your shuttle will be waiting for you at the prearranged time. End your trip with ease, and arrive at Honolulu International Airport in time for your flight. This round-trip transfer service is available 24 hours a day, seven days a week. * This waikiki shuttle service goes to all hotels in Waikiki. * This shuttle service does not include Kahala Hotel.